Before doing research on magnesium, I didn’t really know much. My mom, who is a registered nurse in psychology, does a lot of research since her and my sister both eat grain-free. She alerted me to the fact that once you eliminate gluten or grains from your diet – you’re probably not getting enough magnesium! It took me a few months to finally dig into some research but now I feel much more informed! I hope the following information will be helpful to you! What Is Magnesium and How Much Should I Be Getting? Many sources recommend a wheat cereal, whole grains or bran but I do not eat any of that. I don’t know about you but that’s a lot of food that I don’t necessarily want to incorporate into my diet every single day. Obviously I’d love to eat most of it but to prepare, cook and sit down for all of that probably won’t happen. Later in this post, I’ll go over how to get more magnesium in your diet without cooking all of that. Why Aren’t We Getting Enough Magnesium Today? Unfortunately, many of us aren’t getting enough magnesium due to our soil and farming practices. Our modern soil is very depleted. This is due to farming methods which employ chemical fertilizer, and due to monocropping [source]. According to Dr. Norman Shealy, M.D. Ph.D, “The soil in every country in the world except Egypt has been farmed to a point of magnesium depletion.” Yikes. Personally, I went gluten-free over a year ago to avoid our modern wheat (which is NOT the same kind of wheat that our grandparents consumed as children). Now that I avoid most grains – I’m obviously not getting enough magnesium. Other reasons that we’re not getting enough magnesium: Caffeine, soda, alcohol and sugar all waste magnesium in our system. Mercury and fluoride prevent your body from absorbing it. The calcium and magnesium intake is a balancing act. Too much calcium throws your body’s ability to absorb magnesium. Since I’m not going to be eating whole grains, I’ve found great ways to get more magnesium into my body. Take dark, leafy vegetables and incorporate them into a juicing routine. If you don’t know much about juicing, read Mary’s article here. It’s a great way to get everything you need from vegetables and fruits without chewing/eating piles at a time. Soak your body or just your feet in an epsom salt bath. Epsom salts are a great source of magnesium and your body actually absorbs it better through the skin (vs orally). 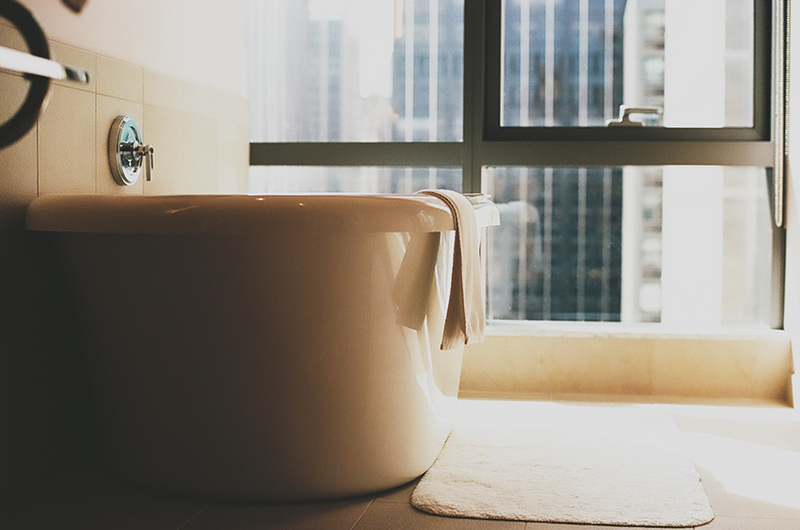 For a full bath, add two cups of Epsom salt and soak for at least 12 minutes. Do this three times weekly. For just a foot soak, add 1/2 cup of Epsom salt to a large pan of warm water. Soak feet for as long as it feels right. Rinse and dry. If you have pets or small children, make sure you clean up and even rise your feet/body off well after so that they don’t take any in orally. Use magnesium oils. I know many people apply these directly to the skin. There are many brands out there so I don’t really have a recommendation. I would say (just like to all products) to look at the ingredients and ask around. In summary, realize that modern farming methods + recent dietary restrictions (gluten/grain reduction) have significantly reduced the amount of magnesium in our daily diet. Here at Considering You, we don’t try to overwhelm you with lists and restrictions – but rather a whole picture to keep in mind when approaching a healthy lifestyle. Keep in mind that many publications will push cereals or other manmade products that have “added nutrients” to increase your magnesium intake. Avoid relying on products like this and realize that you can get a better source from whole foods. This is great information, I had no idea and I certainly do not eat enough magnesium rich foods. I take daily magnesium supplements for better muscle function and hopes that I won’t be so sore from my Fibromyalgia. I’m so glad the post was helpful, Chrissy!! Supplements are always great but it definitely looks like the baths are the best way after eating foods rich in Mg. I can tell if I am not getting enough, because my sleep is off. A doctor told me that magnesium is very important for concentration and sleep. When your magnesium levels are low – are you just not getting quality sleep or can you not fall asleep? We’d love to be more aware with that stuff. Oh man. Bring on the Epsom salt. Woo hoo! Let us know how it goes! Excellent article. I’ve been doing the Epsom salt bath for several months and using the magensium oil – I can tell a big difference. Just beware…. don’t use magnesium oil right after you shave. Stings. I love this! I was just reading about magnesium yesterday, because I found out I might be deficient, so this is such perfect timing. The only thing I found out and was worried about is that when supplementing with magnesium there is a chance of overdosing, and I don’t really know how to make sure to get enough of it but not too much either. I really like the idea of epsom salts though, I definitely have to read more bout them. Yes you can definitely overdose. Honestly the recommended daily amount is a MINIMUM and it’s safe to get more. 300 mg per day is that minimum but since it’s a water soluble mineral, your body is capable of taking care of it. So many people are deficient that you really shouldn’t worry to much about it. Keep epsom salt baths to 3x/week and you can never get too many dark green veggies in your diet! Yeah, I know that the recommended daily amounts are generally very conservative, but the side effects from an overdose seemed quite serious, so thank you for this! I was reading about epsom salts last night and loved what I found out so I’ll definitely give them a try soon, and I love my green smoothies! They’ll be even better in the summer with greens from our own garden. I agree – I definitely would not want to overdose. And your garden sounds lovely. I (Allie) grew only herbs last summer but it was so fun!